Not only that, this way of setting the camp is immune to the annoying 'too much activity' block-message. Unless the icon is greyed-out (and it only is if you're galloping, falling or things like that - just like with horse items, binoculars etc), and you aren't in camp or town, the item wheel camp button will never fail to set up camp. Maybe but you might wake up on the other side of the Map. I never knew you could hitch lifts off npcs. Nice. If you kill and skin a larger sized animal i.e. a Moose, return to the same place where you left the carcass after a few in game days and it will be reduced to a pile of bones. Am I missing something? How do you request rides from wagon drivers? I know you can press forward and jump next to coaches to hang off the side but when I do that I get shot at or they ride towards the nearest Lawman and report me. Well f*ck me sideways and call me Alice. Hot f*ck damn, I did not know that and not one single video I have watched (Apart from that one) has ever shown that. Very useful. And @Cutter De Blanc thank you for mentioning it. Well I tried the requesting a ride feature from a Stagecoach just outside Emerald Ranch going towards Valentine and he let me jump in. Driver and Shotgun with three people inside so I was able to sit inside as well. Very pleasant ride, stopped on the outskirts on Valanetine near the train station, jumped out and Arthur automatically thanked him. Very good feature for whe your in the middle of nowhere and need a ride. This ones for the people who like doing daily rituals like waking up and drinking coffee etc. It's not that big of a find but I just discovered it now. At Beechers Hope you can pour coffee by the camp fire outside of the house when it's completed. Like I said it's something small but in my previous playthroughs I wasn't aware you could do this. That happens with NPCs as well. I had a random encounter with one of the rival gangs once near a good hunting spot. I came back to that location a long time after the shootout to hunt, having completely forgotten about the earlier encounter, and stumbled across their badly decomposed remains. Hey Alice, I'd heard you could request rides but I usually shoot them out of the saddle so never bothered asking myself. Its a passive thing that few people will use but its good if you want to auto cruise to the nearest town. I think it depend of what direction the person you ask is going. There's a few stages of decay. Nice feature. On a more serious note...you found a moose!?! Where!? I'm going insane looking for one.. Easiest way I've found is to go up to Cairn Lake lake and set up camp. You'll be teleported a little bit away from the Lake. Sleep and then jump on your horse (but don't tear down camp) and head over to the slope on the south side of the lake. You should be able to see if a moose spawned in the middle of the lake from far enough away that you don't spook it. If yes, then scope it out to see it's pelt quality. If it's 3 star then get in close and take it down, mission accomplished! If not head back to camp and sleep again. One time I got a moose this way after just one sleep, but the last one took a few tries. Other people like to just save and then constantly reload instead of sleeping but I never tried that method. Other people use some weird bait glitch that never seems to work for me. My way takes longer but will eventually spawn a moose in the middle of the lake. Best bet for a Moose is the cairn lake method. Just set up camp near the lake, sleep until night time, place a few pieces of bait on the frozen lake, run westwards from the lake towards these rocks then swing the camera around and a Moose should appear on the lake by the bait. However it's usually only a standard moose without antlers. If you want the super elusive Western Bull Moose (with antlers) it's honestly just down to luck IMO. Most common spawn points for them are up by Willards Rest (where the legendary Moose is) swimming in Owanjila Lake and around Lake Isobella. Every time I've come across one (literally about 3/4 times in my entire 4 months of owning the game) it's just been by luck when I haven't intentionally gone out trying to find one. Theres a lot of methods on Youtube but I dont think any of them work all the time, like I said it's just down to luck. Hope this helps. When on the ranch in Beechers Hope, sometimes you'll see Uncle resting on the porch in the exact same spot where he died and also in the exact same position. Found this quite eerie when I first saw it. You also see John stood in the exact same spot The Strange Man stands and where John is eventually buried. I think its just after he buys Beechers Hope and is surveying his land so basically John at Beechers Hope begins and ends there. 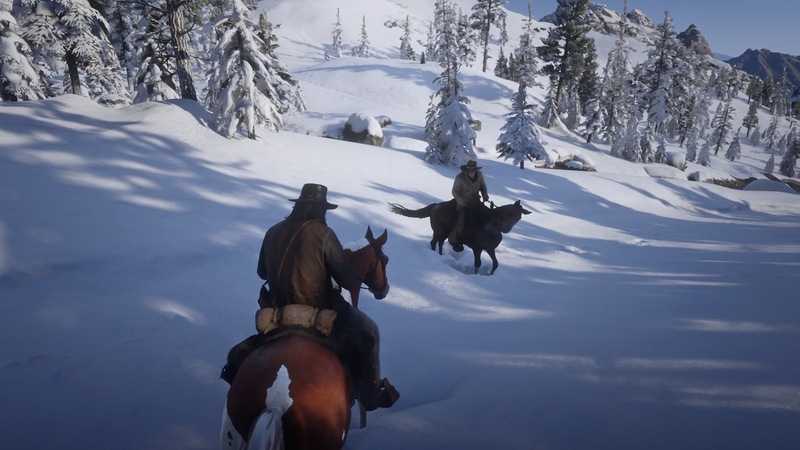 They do a lot in the Epilogues to keep driving that Stake in-there are several instances where John, John and Abby and maybe John and Jack or Charles are standing on or near that spot. Might be why they were buried there-seems to be everyone favorite spot to hang out at. You can rarely see some riders in the Grizzlies West.